Sheila G. Cooney, one of eight children, was raised in the Bronx, NY and attended St. Raymond’s Elementary School, Walton High School, Hunter College and was a member of Dance Educators America. Sheila married James G. Cooney (deceased) in 1950 and has been a member of the White Plains Community since 1951. Sheila’s professional life includes several Office Administrative roles with renowned companies such as Wella Corp (NYC), Con Agra Commodities (White Plains) and Successful Events (Valhalla). Sheila is recognized in the White Plains community for her 15 years of service as a Physical Education & Dance Instructor at St. John’s the Evangelist School. Sheila is famous for creating and production St. John’s Annual St. Patrick’s Day Show, which offered original musical acts by school children and high school CYO members. During this time, Sheila also owned and operated a White Plains based Ballet School for primary aged children. Sheila has been a parishioner of St. John’s the Evangelist for over 54 years. 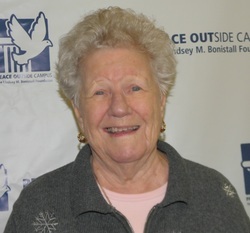 In addition to her years of service as administrator, educator and dance instructor, Sheila has remained a key member and leader in the development and growth of PEACE OUTside Campus, The Lindsey M. Bonistall Foundation. She has led the charge in carrying on the legacy of her beloved granddaughter though the mission of the organization. From its inception in 2005, she carried the role as Treasurer and has been a vital part of fundraising efforts such as the Annual 5K Lindsey Run/Walk, Lindsey Tourney, and Lindsey Night Gala. She has helped raise funds to enable the programs and mission of the Foundation to grow over the last 10 years. Sheila currently serves on the Board of Directors as Treasurer Emeritus. Sheila and Jim Cooney raised four children (Christine Lowery, James Cooney, Tracey Bausé, and Kathleen Bonistall) in the White Plains community of Westminster Ridge. The “Cooney Kids” attended St. John’s Elementary School, Stepinac High School and Good Counsel Academy before moving on to their individual college careers and advanced degrees. Sheila’s legacy has produced nine grandchildren and give great grandchildren, with a sixth grandchild arriving in June 2015!